WEST LAFAYETTE, Ind. – Objects created using 3-D printing have a common flaw: They are fragile and often fall apart or lose their shape. 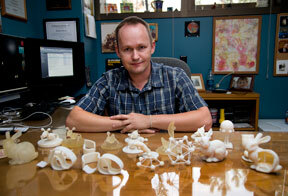 "Now 3-D printing is everywhere," Benes said. "Imagine you are a hobbyist and you have a vintage train model. Parts are no longer being manufactured, but their specifications can be downloaded from the Internet and you can generate them using a 3-D printer." Researchers at Purdue and Adobe's Advanced Technology Labs have jointly developed a program that automatically imparts strength to objects before they are printed. "It runs a structural analysis, finds the problematic part and then automatically picks one of the three possible solutions," Benes said. "The 3-D printing doesn't have to be so precise, so we developed our own structural analysis program that doesn't pay significant attention to really high precision," Benes said. The paper was authored by Stava, now a computer scientist at Adobe, doctoral student Juraj Vanek; Benes; Mech; and Nathan Carr, a principal scientist at Adobe's Advanced Technology Labs. The use of 3-D printing has rapidly expanded in the past couple of years. It is now possible to produce 3-D-printed objects with exceptionally high fidelity and precision. However, although the quality of 3-D printing has improved, both the time to print and the material costs have remained high. Moreover, there is no guarantee that a printed model is structurally sound. The printed product often does not survive cleaning, transportation, or handling, or it may even collapse under its own weight. We present a system that addresses this issue by providing automatic detection and correction of the problematic cases. The structural problems are detected by combining a lightweight structural analysis solver with 3-D medial axis approximations. After areas with high structural stress are found, the model is corrected by combining three approaches: hollowing, thickening, and strut insertion. Both detection and correction steps are repeated until the problems have been eliminated. Our process is designed to create a model that is visually similar to the original model but possessing greater structural integrity.